12 February 2015, at 11:48a.m. RUSSIA - New Russian trade figures show that pork imports were down 40 per cent last year due to trade restrictions affecting the EU, Canada and the US. Prices have risen dramatically as a result. Russian trade data has recently become available for the first time since April. The new figures show that, while Russia imported 542,800 tonnes of pork between January and November 2013, for the same period in 2014 this dropped by over 200,000 tonnes, or nearly 40 per cent, to 329,800 tonnes. This decrease has been stepped, due to successive trade restrictions based on product safety and international politics. Firstly, imports from the EU were banned in February due to concerns over ASF; shipments decreased from 332,000 tonnes in the first 11 months of 2013 (over 60 per cent of all imports) to just 19,000 tonnes (six per cent of the total) last year. Canada and Brazil subsequently increased their deliveries but they could in no way fill the deficit. However, sanctions were then enforced on Canada and the US, as well as the EU, in August on political grounds. This allowed Brazil to expand shipments to over 20,000 tonnes in November, going some way to compensating for the loss of US and Canadian pork but leaving the deficit from the EU untouched. Russia also expanded trade with some of its smaller partners as well, including Chile and Serbia. Agreements with China, India and South Korea are thought to be in progress but had not come into effect by November. Imported pork prices increased by over a third on average for the January to November period. However, as the successive restrictions began to impact on the market, prices rose steadily and by November the year on year increase was up to 80 per cent in rouble terms, partly due to the devaluation of the Russian currency. 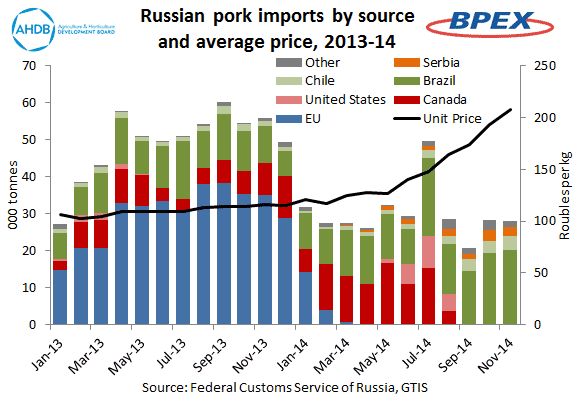 This has inevitably driven pork prices much higher on the Russian consumer market, even with internal pig production reported to be increasing, with a 12 per cent rise in slaughterings. Reports last week suggested that the Russian market was set to reopen to some pig meat products from certain EU countries, including France, Italy and Denmark. However, while progress has been made in discussions, it appears that significant technical work will be required before shipments can resume. Even then, the political ban will remain in place until the summer, at least, and will prevent fresh and frozen pork and some other EU products from being sent to Russia.